The interior portion of your res­toration is as much about percep­tion as it is about reality. How well the interior turns out reflects on the quality of the rest of your GTO’s res­toration. The good news is that this is one portion of the restoration that you can likely do yourself, and just about everything you could possi­bly need is available in high-quality reproduction. Most of the restoration parts available are quite authentic look­ing and work well. There is not as much difference in quality of inte­rior parts as there is with other res­toration parts, such as die-stamped versus hand-formed quarter panels. However, owners seeking the most authentic interiors can spend a little more and get a bit more quality and correctness. Like the rest of the car, the com­ponents of the interior are subjected to wear, tear, aging, and deteriora­tion. While it is indeed possible for an interior to survive in near-mint condition for the life of a vehicle, it is far more likely that its overall condi­tion is consistent with the condition of the rest of the car. Therefore, if the interior is original or more than 20 years old, it needs help. As with other major systems in need of attention, the choice to do this portion of the restoration your­self hinges largely on your skill set, but this is one area where you can save yourself some money and do most, if not all, the work yourself. 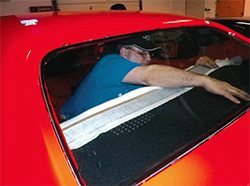 The disassembly requires little more than regular hand tools and with the pos­sible exception of headliner installa­tion, you probably have all the skills necessary to complete the job. As you unbolt and unscrew the original interior pieces, keep in mind that you may be able to re-use more than you realize. Restoration tech­nology has advanced significantly in the last decade or so, and items that were once relegated to the scrap bin can now be saved and re-used because original finishes and textures can now be replicated, sometimes even at home. NOS or reproduction parts might not be available, or too costly for the budget, so refurbishing an otherwise serviceable item offers a solution. A good example of this advance­ment is in the area of rechroming plastic. 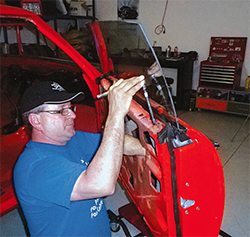 Twenty years ago, the tech­nology was just starting to creep from the model car hobby into the restoration world, but now it is a cost-effective and viable alterna­tive that can return dash inserts, armrests, knobs, and other items to their original splendor. Even if your item is not in perfect condition, it can most likely be repaired prior to the rechroming process. Even large damaged areas can be saved, further extending the budget. 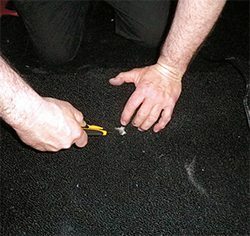 When removing carpeting for replacement, make sure that you remove the insulation and padding underneath. These items are notorious for holding moisture and likely are musty smell¬ing and deteriorating. This is also an opportunity to add some aftermarket sound deadener, such as DynaMat or Eastwood Thermo-Coustic sound deadener. This insulation adds weight to the car but the difference it makes in interior acoustics is really amazing. Best of all, once installed, it is invisible and also insulates the cabin from heat and cold. If you are adding a louder-than-stock exhaust system or a high-end aftermarket stereo system, sound insulation is an inexpensive and worth¬while investment. 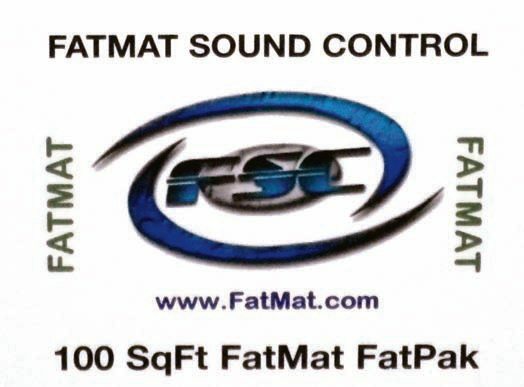 Fat Mat (shown here) is popular with many in-car entertainment installation companies and has many comparable qualities to DynaMat at roughly half the cost. 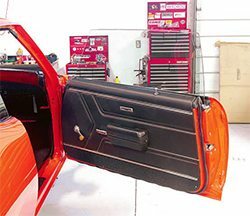 As you remove door panels, unbolt seats, and peel back old car­peting, make mental notes. Youare sure to notice items that are in obvious need of replacement, such as threadbare carpeting, ripped seat covers, and water damaged package-shelf cardboard, but other items may just need a good clean­ing and/or repainting. For example, are the interior kick panels still in good shape? Can they be reused and brought back to new condition with a simple repainting? Can the window crank knobs be polished and returned to service? Can the steering wheel be cleaned, repaired, and re-used? You can really save money by fig­uring out what is still good in your interior. By retaining original pieces, you also have a leg up on authentic­ity. While the impulse may be to grab a reproduction parts catalog and order everything in sight, it might not be the best way to go, budget-wise. Once you have figured out what can be re-used and what has to be replaced, you can start ordering parts. The next question is, “Which products are better than others?” When it comes to soft parts, such as seat upholstery and door panels, Leg­endary Auto Interiors is consistently recognized as producing the best reproduction interior components available. Of course, this comes with a price. Legendary’s interior pieces are consistently 30-plus percent higher in price than from its com­petitors, but in the end, it boils down to whether you want to pay the premium price for the superior quality. The other main interior parts sup­plier is Parts Unlimited, Inc. (PUI). While Legendary is the choice for the concours, points-judged crowd, PUI also offers some high-quality components at more affordable prices. 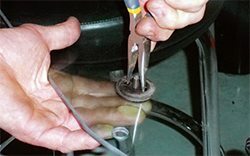 The main difference is in the finish­ing the vinyl PUI uses is correct, the contours are good, but in many cases, additional work is needed to get them to work correctly. For example, PUIs door panels holes for window cranks, armrests, and door handles are not pre-cut into the vinyl, though some holes are cut in the cardboard base. Those have to be opened up by the installer. Of course, that negates their returnability. 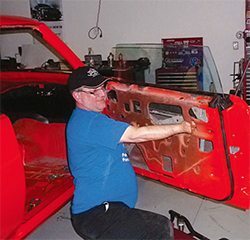 In some cases, more assembly is required, such as with interior quar­ter panels, and seat covers may need some additional effort to position correctly. If you are pinching pennies and don’t mind a little extra work, PUI interior parts are more than acceptable. In order to show you how to cut the holes and do the extra work involved, we are using PUI interior parts in this book. Soft items, such as seat covers and interior door panels, must be of the same condition and from the same company to maintain a con­sistent appearance. If one seat needs recovering, do them all. It does not make sense to recover one bucket seat and not the other, or have front and rear bench seats not match. 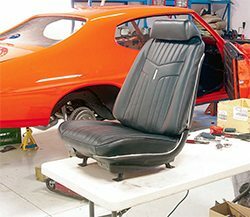 While it might appear to save money, it quickly reveals itself and the seats do not look uniform, harming the over­all appearance of the restoration. The perception of the entire restoration is reflected in the interior skimp here and some may wonder what other shortcuts were taken elsewhere. 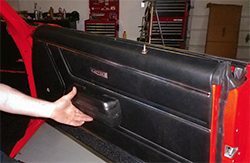 Whether you call them vapor barriers or water shields, they are the paper shields installed between the metal door shell and the inte­rior upholstery panel. Factory units were made out of tar-covered paper, and they become deteriorated after decades of use. When that happens, the cardboard backing of the door panels becomes wet and distorted, becoming warped and moldy, requir­ing replacement. Moisture can even move into the carpeting and dam­age the floorboards, causing rust problems. 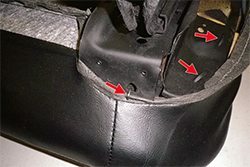 Wet footwear bringing moisture to the carpeting and water leaking from the doors into the cabin are the main causes of floorpan rust damage. The water shields work in con­junction with the water drains in the door shell to keep water out of the interior. When rain collects at the base of the door glass, the water shields are part of the routing sys­tem that moves water into the drain holes. If they are not present or not working properly, water seeps into areas it is not supposed to and causes damage. While the original-style paper units are available, it makes sense to use plastic replacements, as they are much more resistant to the elements. These are available commercially, though you can make them yourself out of clear or translucent polyeth­ylene sheeting for just a few bucks. Use the original units as templates and simply cut out new ones with a scissors. It makes sense to use water shields made of a non-biodegradable material and further protect your investment. 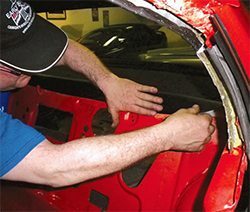 Attaching vapor barriers to the door shell is accomplished with trim adhesive or strip caulk. Using trans­parent plastic shields has the added advantage of allowing you to see whether your installation is actually sealing off the elements. Factory carpeting was a rayon/ nylon blend molded to fit the con­tours of the floorpans. Depending on the model year, assembly plant, and supplier, some minor variations did occur, but these don’t affect perfor­mance. The carpets were a two-piece design with the rear installed first and the front section fitting over it at the trailing edge. While carpet replacement is not brain surgery, there is a more to it than pulling the old one out and sticking the new one in. The seats must all be removed, along with the seat tracks, console, and sill panels. The factory installed insula­tion should also be removed at this time chances are it is deteriorated, damp, and smells bad. The carpet installation also assumes that any repairs to the floor­pans have already been performed at this point in your GTO restoration. 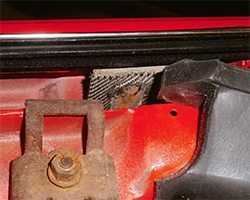 If you find rust holes or rust damage that weakens the floorpan integrity, refer to Chapter 3 for instructions on floorpan replacement. The inside of our 1969 Judge is as empty as a tin can. There is actually a bit of work to do before the carpet installation, most notably, the installation of the seat tracks. Test fitting all the parts ensures a smooth final installation. As for the quality of reproduction carpets, most restorers report that there is not much, if any, difference in quality in the offerings of various manufacturers. 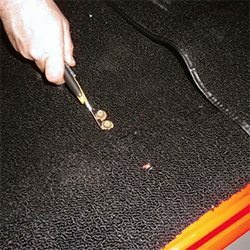 Auto Custom Car­pets, Ames Performance Engineering, Performance Years, Original Parts Group, and Year One offer suitable replacement factory-style carpets. 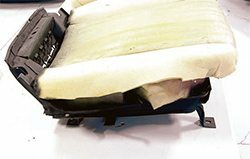 With the advancements made in materials since these cars were new, it makes sense to use some modern sound deadening insula­tion, though replacement-type materials are available. There are many good products available, such as DynaMat, Eastwood Thermo- Coustic, or Fat Mat. You can also get creative and use suitable radi­ant barrier as found at many home improvement stores. The upshot is that whatever you use, it is invis­ible, so appearance is not affected, though having a quieter, more solid feeling interior enhances the overall quality of your project. Door-sill panels are one area with a slight difference in authentic­ity. If you are looking for the most authentic reproductions available, make sure that the Fisher Body tag is correctly riveted onto the sill, rather than simply glued on. If you find yourself with glued-on panels, you can get the correct panels from Origi­nal Parts Group. Be sure to roll out the new carpet flat and look for wrinkles or imperfections. The wrinkles can be steamed out at installation time, but damage or a manu­facturing defect doesn’t go away. At this point, the carpet is still returnable; if it is altered in any way, it’s yours. While some installers have exotic and expensive steamers to do the job, you can use a low-buck, low-tech alternative. It is nothing more than a tea kettle with a long length of heater hose clamped to the spout. Using a hot plate or camping stove as a heat source, the steam passes though the tube and exits at the far end. Total cost was less than $15. If you want to be a hero, buy a nice new tea kettle for your wife/girlfriend/mother and take her old one in trade. The test fitting begins with laying the rear carpet first and then the front. The trailing edge of the front should lay over the leading edge of the rear. Use a knife to make cutouts for the rear seat frame so that the seat can lock into the mount without interference. The seat belt anchor areas need to be opened up in order to install the bolts. Cut holes rather than Xs. This way, the bolt threads are not cut into the carpet causing it to unravel. Cut away the floor shifter area to allow for its proper operation. If your car doesn’t have a console, use the boot trim as a template for the cut. You can be a little more liberal with the cutting if you have a console, but be careful not to cut away more than is necessary. Uncover the seat anchors, cutting small circular holes. 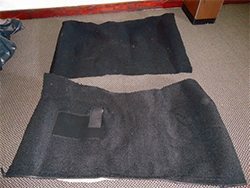 If your carpet is significantly wider than necessary, hanging over the rocker panels, cut it back to make it easier to work with the door sill panels. After the excess is cut away, use the sill panels as guides to make the final cuts. The PUI interior door panel looks very authentic and correct but lacks some of the holes needed for a proper installation. Some are pre-drilled in the cardboard backing and not in the vinyl and some are not there at all. The upshot is that the holes are easy to cut and the cost of the panel is significantly less than the Legendary equivalents. Both look correct after proper installation. If your original armrests are in good shape, you can clean them up with Simple Green and reuse them. If your restoration uses all new glass, pull out the original windows and transfer the hardware to the new side glass. The difference it makes to the overall appearance of the car is nothing short of amazing. This replacement door glass is an exact reproduc­tion, even down to the date-coding etched into the surface. Bolt the glass to the window track to allow it to go up and down. Even though there are rubber grommets that go between the glass and the metal track, there is no need to tighten the bolts to anything more than snug. The last thing you need to do is put a stress crack in the new and expensive door glass. Loosen the window tracks in the door in order to install the new glass. Carefully slide it in and test for up-and-down clearance. When realigning all of the pieces, take note of the cloth-covered glass tensioners. These keep the window moving smoothly in the track and help the glass contact the window seals to provide a watertight fit. This cloth-covered tab puts tension on the window to hold it firmly in place as it travels up and down. Be sure to check the tabs for condition, as they can scratch the glass over time if the protective cloth is damaged. Make sure they are still flexible and able to keep the glass in the track. If not, remove them and replace them; it’s a simple bolt-on. The door lock mechanism requires the two plastic clips that locate and retain the metal rod assembly be intact to prevent binding, which would hinder the up-and-down movement necessary to operate the lock. These clips snap into the door shell without tools, but if they are broken, they need to be replaced. Reinstall the linkage for the door lock button. Add white lithium grease, both to allow the plastic holder to slide into the door easily and to prevent sticky operation of the door locks. The homemade plastic vapor barrier goes on with stick caulk. After the holes were opened up with a scissors and were trimmed to match the hole punched in the cardboard, the doorhandle and window crank, both were re-installed with the ring clips. Once the door panel, window crank, and door handle are installed, the last part of the procedure is to reinstall the armrest. If yours are usable, a cleaning is likely all they require. If you need new ones, they are available from most of the restoration parts houses. It is advisable to replace all of them if one is bad in order to keep the look consistent. This original armrest was in near-mint condition and went back on using the stock screws. The door panel installation was completed and it looks great. 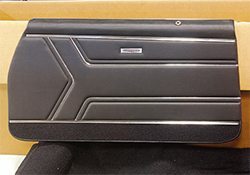 As mentioned, the PUI door panels did require more finishing work for a proper installation, compared to their Legendary Interiors counterparts, but they are quite a bit less expensive. If you are willing to do a little more work, it is an opportunity to save some money, which could go elsewhere in the restoration. The installation of the rear deck package is one of the easier operations. It can be finished in minutes. Start by test fitting it and sliding it into place without. Ideally, it should slide under the base of the rear window. The upholstered flap is left up as shown. Spray a light, but even, coat of glue over the top of the rear bulkhead panel, just enough to see a light beading. Carefully spread the upholstered flap over the top of the bulkhead and smooth it down. That’s it! Dash pads are an area where you spend a lot of money for absolute authenticity or sacrifice a bit of cor­rectness for huge savings. When per­forming a concours-type restoration, it is standard operating procedure to take any less-than-perfect dash and send it to a company such as Just Dashes or Dashboard Restoration USA for a complete remanufacture of the original dash to as-new condition. Replacing the dash pad is a time-consuming job, but in many cases necessary because the existing dash has been sun-faded and cracked, and for all intents and pur¬poses, it’s worn out. To remove the dash, first remove the pedals, defroster assembly, ashtray, radio, and steering column. Once this is done, you have access to the dash and are able to remove it in one piece. Once the dash is removed from the car, you have full access to the gauges and the wiring harness. Remove the gauges, lights, and wiring from the dash panel. If the wiring is original, it may be brittle, cracked, or frayed. If this is the case, the wiring must be replaced. 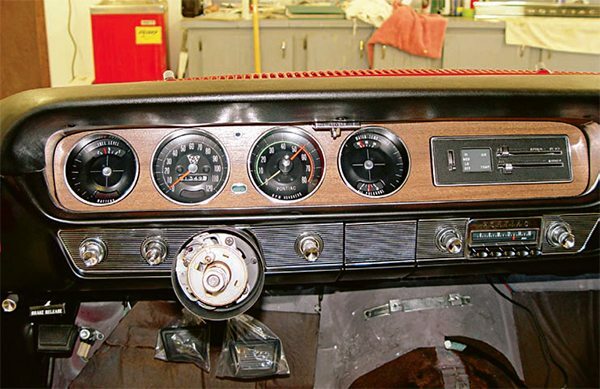 Often, the metallic bezels for the speedometer, tach, and gas gauge need to be refinished and you need to send the dash out for this to be done by a professional. If the gauges themselves are functional, you can re-install them. However, for a factory-new appearance, you should send out the gauges for reconditioning. 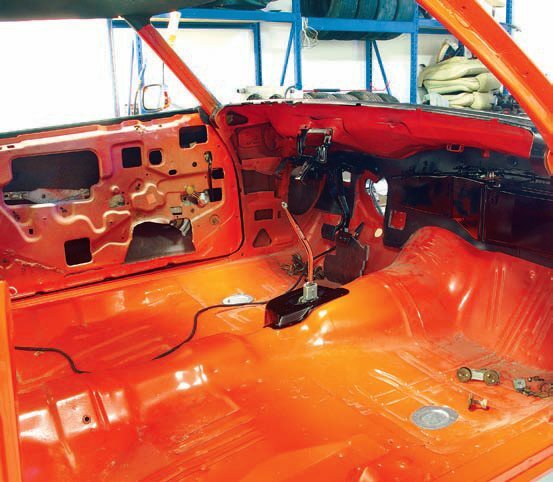 To restore the finish of the dash, professionals apply a metallic material to the various areas of the dash. Once that has been completed, the walnut veneer is applied to the dash. It is a costly and time-consuming procedure that can run more than $1,000, depending on the year of the car, the condition of the original unit, and who is doing the work. 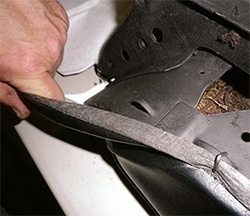 In a “worst case scenario” dash restora­tion, the unit is completely stripped of the vinyl cover and foam. From there, new foam is installed and shaped to provide the perfect fit for the new vinyl cover. Adhesive is then sprayed over the foam. From there, the part is placed in a vacuum-forming machine, where it is heated until pliable. 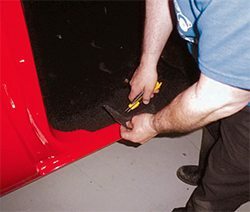 Then a sheet of correctly-grained vinyl is sucked over the foam, replicating the origi­nal shape of the dash. It is cooled, excess material is trimmed off, and the edges are glued into place. The process is completed when the cor­rect color is applied to the dash. While it sounds simple, it is an involved process that is time-consuming and, thus, costly. 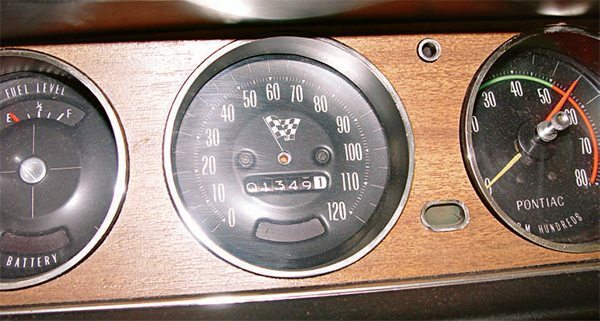 The end result is a restored dash that cannot be distinguished from an original piece it really is that good. For many restorers, the cost of a high level of authenticity cannot be justified, particularly if the car is going to be a driver. 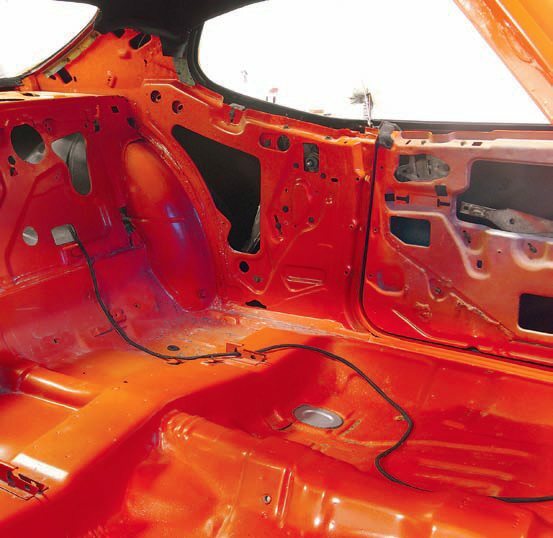 If you’re restoring a car that’s destined to be a points-judged car, you have to invest in a top-quality interior. But if you are a home-restorer building your car on lunch money, it’s most likely a bit too much. Fortunately for bargain-hunters, an alternative is available in the form of a vacuum-formed dash cover that fits directly over the cracked, nasty original. While the quality can vary from year to year and manufacturer to manufacturer, there are good ones that when properly installed, are dif­ficult to detect. They usually come in black and can be painted to match any interior. Best of all, they can be installed without removing the dash and they glue into place using 3M Trim Adhesive or an equivalent product sometimes supplied with the kit. The cost can run between $80 and $300, the dashes from earlier model years running quite a bit less due to their simpler design. The downside is that they often are a harder plastic than original, and while they usually look fine, they do not have the same feel. This might be offset somewhat by the feeling of having $800 left over in your pocket to put elsewhere. 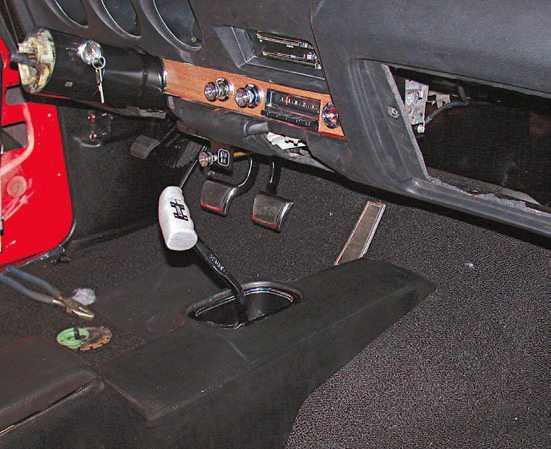 Fortunately, the floor pedals of your GTO do not require a tremen­dous amount of attention. Aside from replacing any parts too damaged to use, they do not need anything more than painting and replacing the rub­ber pedal pads. Original standard steering wheels feature steel rims with a plastic outer layer. In the early years, the wheels were a hard plastic, which tended to crack with extended use and exposure to ultraviolet rays. You can restore them with a repair kit, such as ones offered by POR-15 and Eastwood. From these kits, a plas­tic putty is carefully spread into the cracks and sanded smooth. Then the rim is prepped for paint with clean­ing agents supplied in the kit and repainted. The chrome trim is pol­ished or replaced. This method is great if the wheel isn’t too badly damaged, and there aren’t any missing pieces of plastic. However, if the wheel is substantially damaged or worn, you won’t be able to correctly repair it on your own. Therefore, you should buy a wheel in better condition at a swap meet, from classified ads, or on eBay. 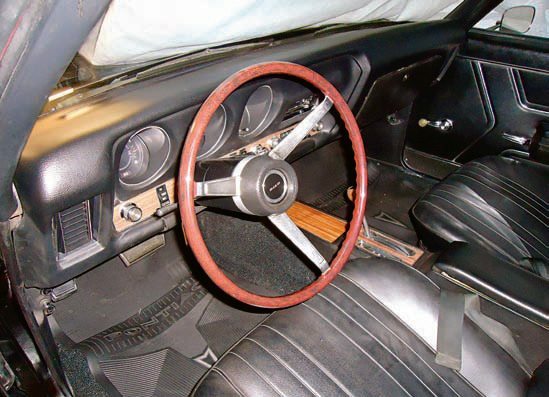 If you have a seriously damaged original steering wheel and want to bring it back to concours-level con­dition, companies such as Quality Restorations or D&D Automobilia can help. 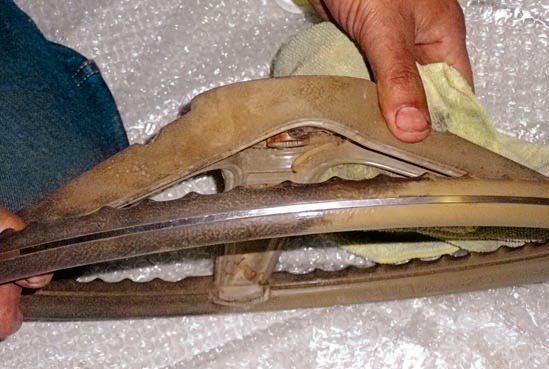 They strip all of the plastic off your steering wheel and recast it, so it is exactly as new. This procedure can run north of $1,000, so like the dash recovering, it is a costly process. In 1969, the standard GTO steer­ing wheel was a vinyl-cushioned three-spoke design with a matching vinyl center. These wheels, while softer, proved to be very durable, and as long as they are not cut, can usually be brought back to like-new condition by disassembling and thoroughly cleaning. Never use a petroleum-based cleaner on any plastic steering wheel, as it severely damages the finish. Instead, use a biodegradable cleaner such as Simple Green. The stuff is amazing, removes years of dirt and grime, and rejuve­nates the wheel’s appearance. The standard steering wheels on early GTOs are made of opaque plastic over a steel rim and they sometimes crack. Eastwood Company has a line of fillers and primers that remove the cracks and prep the wheel for final painting. If the steering wheel is missing or you just want the optional and highly sought-after wood wheel, quality reproductions are now available. 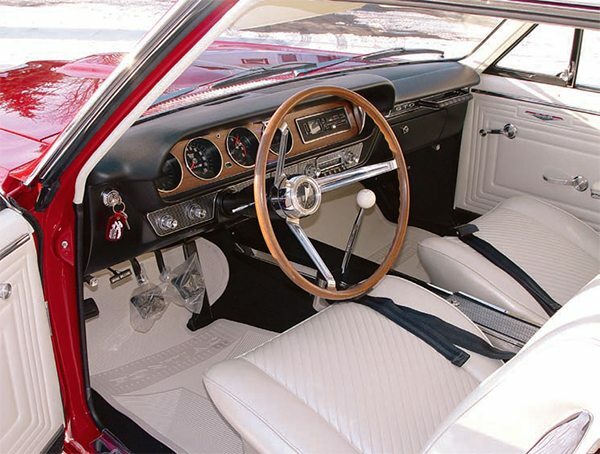 Later GTO standard steering wheels are steel rims cov¬ered with flexible vinyl. If they aren’t damaged, they can be brought back with a thorough cleaning. Never use any¬thing petroleum-based such as paint thinner to clean the steering wheel, as it destroys the plastic. Instead, use a cleaner such as Simple Green, which does a fantastic job of removing years of dirt and grime. Allow to dry thor¬oughly and reassemble. Of course, there is also the pos­sibility of adding a wood wheel to spruce up the appearance of your interior. While originals can sometimes top $2,000, depending on year, reproductions are now on the market that look very authentic and cost significantly less. Most years cost in the $300 range, though the rarer 1964 version is now available for about $500. Admittedly, that is a lot of money, but it’s more affordable than a recast of a standard wheel, and it looks better. Restoration of an original wood wheel is even more complex than that of the standard wheel. The rea­son is because the wood isn’t really wood but wood-grained plastic. Actual wood was rejected from pro­duction due to the possibility of splintering in a collision. Again, the process for restoring them is expensive, but some have had good luck at home restoring them. The procedure is similar to restoring a standard wheel using putty, surface prep, and paint. It is difficult, but not impossible to recut the wood grain in the wheel. There are several companies, such as Gary’s Steering Wheel Restoration, experi­enced in the process and can do the job for a reasonable price and guar­antee it. My advice is to have a pro do it because the time you spend to complete the restoration could be better used elsewhere. As with any safety device, this is an area where corners should never be cut. Reproduction seat belts are available from most restoration parts suppliers. 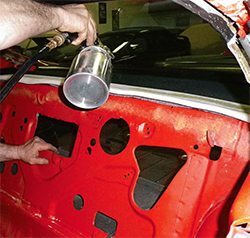 Additionally, restoration services for originals are available from companies such as Snake Oyl Products and Morris Custom Clas­sics. They disassemble the originals, re-plate the buckles, and replace the original webbing with new equivalents, authentic down to the date-coded labels. If your seat-belt hardware is in good enough condi­tion, these companies add new belt webbing to your existing belts. It is more cost effective than a full resto­ration, yet it returns full functional­ity to your safety restraint system. Whatever you do, resist the temptation to re-use the original belt material. I know that some restorers just clean them with Simple Green, let them dry, and call it a day. This is, in my opinion, an unwarranted safety risk. In any restoration project, the belt webbing should be replaced, as it can be a safety hazard due to aging, deteriorating fabric. If you want to use more affordable repro­ductions, fine just don’t risk disaster by re-using the original belt webbing. You and your family deserve better. Kick panels came by their name naturally, and as a result, are not always treated well. 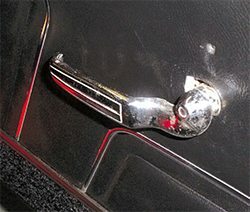 On non-air-con­ditioned cars, the kick panels house vents, which are operated by a cable with a knob on the end. These cables can become bent, which greatly hinders their operation. As a kid, I remember trying to shut the vent on my dad’s car by pushing the cable with my foot and bending it badly. Of course, I got in trouble for it. After my father repaired it, I remember the chewing out being severe enough to never attempt it again! The panels themselves are prone to rough usage and can sometimes be damaged in the process. Remove them by pulling them away from the body once all of the screws are removed. Getting your fingers behind the outer edge of the vent hole or the bottom gets the process started. The passenger side should be fairly easy, but the driver’s side sometimes requires the emergency brake pedal to be removed. The panels are fairly flexible, so it is a matter of maneuver­ing them to clear the bottom of the dash. Once they are out, they can be painted with vinyl paint or replaced. Be consistent paint them both or replace them both. More importantly, once the kick panels are out, clean out the ducting. Over the years, leaves, twigs, pine needles, and other assorted debri get in there, retains moisture, and cause rust damage. GM designed its Astro Ventilation system to use these ducts as a primary source of fresh air, and they have built-in water ducting and drains that keep water out of the interior. They work together with the drains in the cowl sides, rock­ers, doors, and quarter panels. When they become clogged, they retain water and rusting begins. If bucket seats were installed, consoles were available on any GTO. Over the years, the designs changed, though a cast-plastic base was used throughout the GTO production run. The 1964–1966 versions featured a ribbed, chrome-plated, pot-metal top surface. In 1967, woodgrain appli­qués were used. 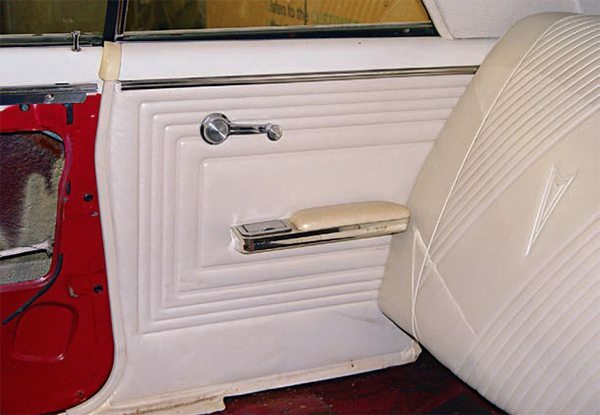 In 1968, a new design featured a grained plastic outer body and a padded-and-upholstered stor­age compartment door. 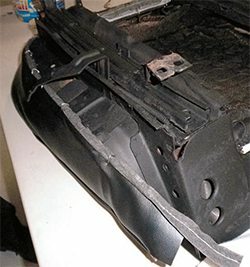 Consoles take quite a bit of abuse, particularly the storage compartment door, which can become damaged, as well as the mounting points for it on the base. Once the base is bro­ken, it is quite difficult to perform a satisfactory repair the combination of aging plastic and the stress point at the mounting bracket ensures any repair is a temporary repair. Most pieces necessary to put your console back in tip-top shape are available from the aftermarket, including storage compartment lids, wood-grain inserts, trim pieces and fasteners, lamps, wiring har­nesses, shift selector indicators, among others. Reproduction bases are avail­able for all applications from 1964 to 1972, except for the automatic 1968 version. 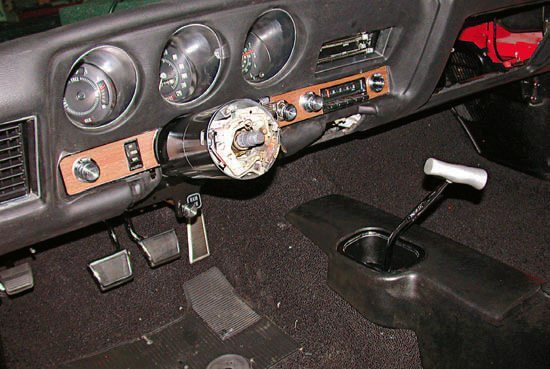 There are differences in the shifter bezel area and though a 1969-up version fits, it is not correct. Additionally, a complete reproduc­tion console kit for 1965–1966 mod­els is available. 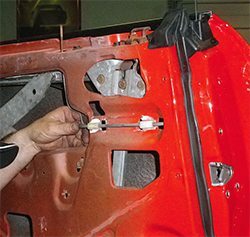 If you plan to add a console to a car that didn’t originally have one, you must drill holes to mount it to the transmission/drive­shaft tunnel and add the proper wir­ing harness for the lighting. On this project, the original seats were disassembled and relieved of their original covers. The springs were not broken and had not sagged. Though the seat frames and springs were originally left as bare metal by the factory, these were shot with semi-gloss black paint to prevent rusting. 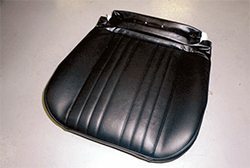 The original seat cushions, sometimes referred to as buns, were still firm and supple, without any drying out, so they were retained. If yours are dried out or otherwise unusable, reproductions are available. In order to fill the seat covers and compensate for any settling, thin sheets of foam can be glued on the outer edges of the cushions. Use hog rings to fasten the seat cover to the frame. 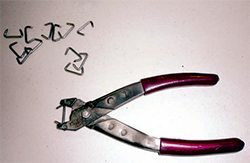 Load them into a special set of pliers and bend them into shape. 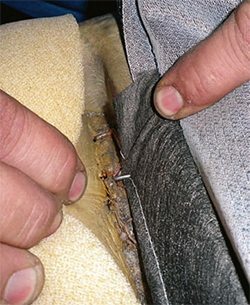 Hog rings pierce the upholstery along a seam reinforced by a metal rod. The rods are not usually included in a reproduction seat cover kit. If the rods are not usable from the original covers, new ones can be fashioned out of sections of a brass coat hanger. The brass does not rust away like steel does. Blocks of foam can also be stuffed into the void between the bottom of the seat bun and the frame to quiet the metal springs. This area is hidden by the bottom seat cover. Lay the new seat cover over the seat cushion and check for the general fit. Some brands of reproduc­tion covers may fit a little better than others, but with a bit of coaxing, you can attain a satisfactory and attractive outcome. 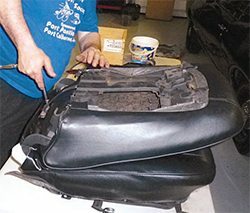 Carefully guide the reinforce­ment rod through the sheaths built into the seat cover. There are sheaths located around the bottom perimeter and also in the area between the main seating area and the side bolsters. Use a wire cutter to trim off excess coat hanger. Attach the hog rings at approxi­mately the same spacing as they were originally applied at the factory. If you are using the original cushions, you can see the holes for the originals. If you are using reproduc­tions, use the originals as a guide for proper placement. There is no benefit to using too many and you could actually cause the sheath to separate from the cover. The installed hog rings should look like this. They have properly secured the reinforcement rod and sheath on the seat cover to the cushion and seat frame. Continue the process on both sides of the seat cushion bun. With the seat base upside down, carefully pull the cover over the bottom of the frame. The arrows reveal the mounting points for the hog rings. They are the tabs cut into the metal seat frame. 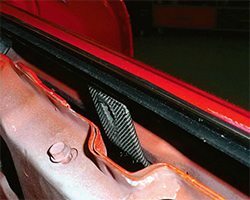 Pull the seat cover’s reinforce­ment rod and sheath over the lip of the seat frame and attach the hog rings to the tabs. Continue fastening the lower cover to the seat base until all tabs have been hog ringed. 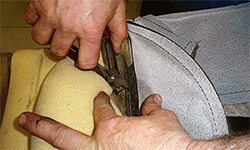 The hog rings follow the perimeter of the seat cover and connect to the frame to anchor the fabric. The seat cover is stretched tight for a finished look. The reinforcement rod is in the sheath. The vinyl in the seat cover has been properly pierced and the hog rings connect it to the seat frame. Three hog rings secure the vinyl in the center section of the seat. Evenly stretch the seat cover over the seat frame. After you attach the hog rings on the front and sides of the seat base, move to the back side. Fold out the flaps of upholstery and test fold them around the seat frame. Identify the tabs or holes made for the hog rings. If your cardboard kick guard is in good condition, it can be reused. If it is damaged or missing, a new one can be purchased. If avail­able, the original can be used as a pattern to make a new one out of fresh cardboard. Likewise, a length of coat hanger can be used in the bottom sheath. With the cardboard positioned, stretch the flaps of the seat cover over the edge of the seat frame and use pliers to crimp the hog rings over the seat cover so it’s secured in position. Screw the seat back stops back into place. Use a screwdriver to pierce the upholstery and drive the screws into the screw holes. Wrinkles will undoubtedly appear and they won’t go away unless they are dealt with. Use a heat gun to remove them. 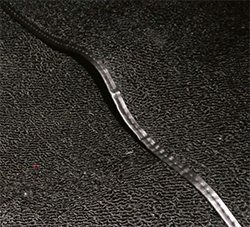 A hair dryer isn’t strong enough to perform this opera­tion and a heat gun quickly damages the vinyl if left in one place too long. 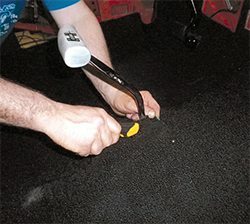 The best results come from keeping the heat gun moving at all times and gently smoothing the vinyl with your fingers. Don’t get too rough or the heated vinyl can distort. The completed seat bottom looks as good as new. Set it aside for re-uniting with the seat back later. 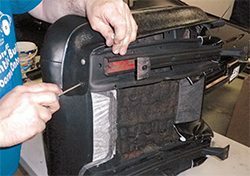 Begin the procedure for reup­holstering the seat back by removing the trim medallion from the original seat cover and installing it on the new cover. Carefully measure the location and recheck it before you punch two small holes through the upholstery. Fasten the trim medallion to the seat cover by bending the retaining tabs against the upholstery panel. After you confirm the proper measurements, this should only take a minute or two. Installing the seat back uphol­stery is pretty much the same as for the base. Position the seat cover on the frame and carefully pull it over the edges. Fabricate retaining rods from coat hangers, and slide them into the sheaths. Once in place, hook the hog rings around the sheaths and anchor the hog rings on the frame. Be sure to look for the mounting tabs or holes on the perimeter of the seat frame. Hook the hog rings through the seat cover and around the seat frame. These slots on the bottom of the seat back are the factory mounting points for the hog rings to secure the seat cover. Complete the hog-ring installation for the rest of the seat back. Hook the top of the seat cover around the wire frame with hog rings and use the pliers to crimp the hog rings to the frame. Attach the top of the seat cover along the area just below where the plastic back attaches. Drive two bolts through the mounting bracket on the seat back to secure it to the seat bottom. Do not apply a lot of torque to the bolts. They do not need to be any tighter than what you can do with a small ratchet. A little Lock-Tite to secure these bolts is a good idea. These reproduction seat trim panels do not have the holes drilled in them for their attachment to the seat frames. Locate the attachment points and carefully drive the screws through or drill out the plastic. If the holes are too large, the stock screws don’t hold the panel in place. The seat back also needs to go on at this time. If you are using a reproduction, install the seat back release button on the original attaching points. This completed seat looks as good as new and is ready for installation.